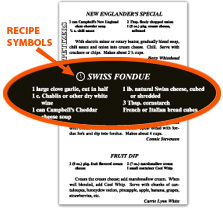 Fundcraft has a number of special recipe symbols that can be used to denote recipes that are in some way special. The selected symbol will print at the side of the special recipe title. There will be a key of all symbols used at the front of the book. The symbols are not intended to mark every recipe, only those with special importance. The symbols must be indicated on the recipe collection forms next to the recipe title or entered in the Short/Cut™ recipe typing software. There is no charge for this option and it allows one symbol per recipe only.